A new company, spun off from a University of Exeter experiment, is going commercial with a 3D Printer that prints chocolate. In an initial fundraising effort, Choc Edge Ltd is auctioning off ten “trial” units of the Choc Creator V1 on April 10. And, they’re accepting pre-orders for final production models at a price of £2,488 (about $4,000). The Choc Creator feeds the chocolate from an easily refillable syringe-based chocolate deposition head so that a user can quickly change up the production for different types of chocolates. 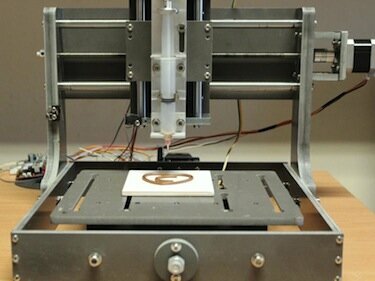 It’s a concept that is pretty much similar to a home 3D printer, but instead of printing in plastic it prints chocolate. For a complete overview of the Chocolate 3D printer, watch the video at the bottom of this story. Very, cool idea, but we're waiting for a model that look good in the kitchen. The press is going gaga over this, and I hate to rain on the parade, but I only see this an interesting first step. After all, it’s not the kind of contraption you’d want to put on your kitchen counter. In addition it’s also quite expensive for a home appliance. As for commercial use, I just don’t think it can pump up the volume high enough to warrant producing chocolates in this manner, especially on such a small build platform. I hope they can meet their projected sales target of 500 -1000 units sold over the next three years, but I’m having trouble seeing it happening unless they either make a cute home model that looks good next to the espresso machine, and costs under $500, or if they make a commercial model that can create more chocolate pieces at a faster pace. Disclaimer: Choc Edge is in the process of obtaining food grade certification for the Choc Creator printer. Pre-order Choc Creator printer is not currently food grade certified. The printed chocolate is therefore suitable for printing trials and demonstration purpose only and not suitable for consumption. Regardless, we’re happy to see 3D printing moving forward on all fronts. The Video we placed up top is the current promotional video, but we think this video presents is a bit better, since it shows more height in the printed pieces.